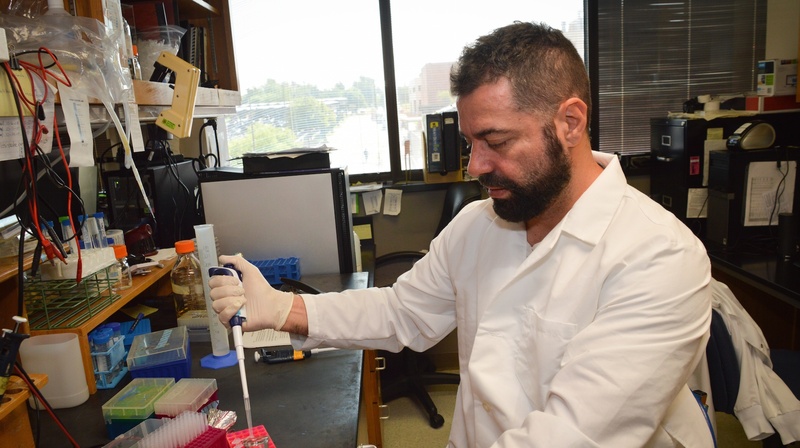 OMRF scientist Roberto Pezza, Ph.D., has received a five-year grant from the National Institutes of Health to study cellular mechanisms that regulate DNA metabolism, particularly how damaged DNA is repaired. The grant, awarded by the National Institute of General Medical Sciences, will provide Pezza with $1.4 million to better understand how errors in DNA repair result in serious health consequences. DNA repair errors are responsible for a variety of birth defects as well as conditions like Down syndrome or Turner syndrome that result from an incorrect number of chromosomes in an individual, also called aneuploidy. Every year an estimated 7.9 million children—6 percent of total births worldwide—are born with a serious birth defect of genetic or partially genetic origin. Pezza’s lab used reproductive cells from both male and female mice to study damage and repair of DNA. Accurate division and chromosome segregation in reproductive cells is essential to avoiding aneuploidy and maintaining stability of the genome —the complete set of genes or genetic material in an organism. To study this process, Pezza looked at how chromatin affects repair of DNA. Chromatin is the material the material of which the chromosomes of several organisms are composed. It consists of protein, RNA and DNA. “One essential function of the chromatin is to package DNA inside the nucleus of a cell. This creates a compacted environment that makes repair of DNA very difficult for the cell,” he said. The cell seems to have evolved a mechanism that easy this problem allowing DNA repair by loosening the compacted chromatin and allowing the original sequence of DNA to be restored. Pezza’s lab is working to unravel how these helpful mechanisms—that involve protein complexes called chromatin remodeler complexes—control the function of DNA repair, and ultimately what role they play in maintaining chromosome stability and their correct number in male and female gametes. “By better understanding how damage and repair of DNA occur in the context of the chromatin it could allow for the future development of therapeutic targets to help prevent disease conditions,” Pezza said. The grant, R01 GM125803-01A1, is funded through the National Institute of General Medical Sciences, a part of the National Institutes of Health.